This is Not the World is not for me. It is also my least favorite Futureheads record to date. All the complicated layers of harmonies and hooks have been compressed together into a tidy, less frantic ball of wax. This ball has then been shaped into a wax figure of the band; a not quite real life version of the group that floored the world with their self titled debut release in 2004. Rather than highlighting the fact that all the members can carry a tune, this time the harmonies are buried and pushed forward is one prominent, adult voice. The Futureheads have grown up and become a whole lot less interesting. Had I not known this was in fact The Futureheads I might be asking who is this less dazzling imitation band. It isn't that I want the old band back. I just want the attention to detail, the hurricane attack, and vocal melodies that kept me guessing what would come next. This is Not the World not only fails to surprise, it falls flat. 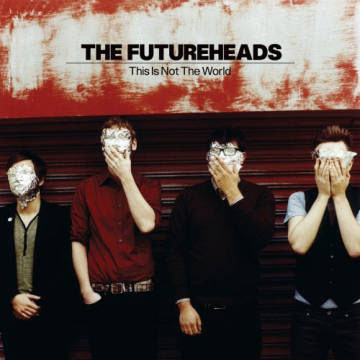 The Futureheads have the distinction of being the only band pin I have on my handbag and if it weren't for the fact that I truly like all their other records, I almost considered retiring it to the jewelry box after this one.